Matehy 4Mile Run. Congratulations to all runners and walkers, of all ages for completing the Matehy 4 Mile. It was a beautiful morning with some great times ran. Special congratulations to Conor Sheehan who was the first student to cross the line. Thanks to all of the volunteers, sponsors, participants, all in Ballyanly Community Centre and the organising committee. First to cross the finish line was James Kelleher and the first woman across the line was Anita Murphy, congratulations to both! School website. We are delighted to announce the re-launch of our school website. The home page will be in blog format so that you can easily keep up with school news. The school now also has a Twitter feed (@vicarstownns) and the Facebook page is being reactivated. The three sources; website, facebook and twitter will all be linked so you can choose one or all to follow. This is a work in progress, so keep in touch. World Book Day. 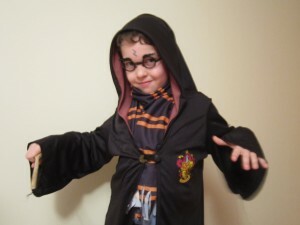 Harry Potter took a day off from Hogwarts to visit us for World Book Day. Harry was really impressed with the level of interest in reading among the pupils and couldn’t believe the amount of people who had read his life story. He finished up by running a ‘Quiddich Skills Test’ where he shared a few tips and tricks before he finally flew off on his Nimbus 2000 into the skies over Vicarstown. Well done to all the children for dressing up as their favourite book characters. First Confession and Enrolment Mass. The Holy Communicants received their First Confession on Wednesday March 2nd. All of the children are enjoying their preparation for the sacraments and the Confirmation Enrolment Mass will take place at 7pm on Tuesday March 8th in St. Joseph’s Church Matehy. Trip to Milano’s Italian Restaurant. 3rd and 4th class went to Milano’s Italian Restaurant on Tuesday March 8th. They learnt all about the workings of a restaurant, how to make delicious pizzas and an Italian song or two! 5th & 6th Class visit CIT for Engineers Week. Pupils from the school really enjoyed their visit to CIT where they witnessed and participated in scientific experiments. Scientific Sue explained to them how dragons fly and how they breathe fire and vapour. Launch of Vicarstown’s vault of secret recipes. On Friday March 11th the pupils of 5th and 6th class will launch their Cookbook ‘Vicarstown’s Vault of Secret Recipes’. This is a book of recipes sourced from the local community and some well known Irish people. Come and buy our book, have a cup of tea and a cake and meet your neighbours! The launch will take place at the school on Friday March 11th from 9.30am to 11am and 1.30pm to 2.30pm.